Jiang-Li is a 5-year-old Miao Minority girl from Qingzhen City, in Guizhou Province. She was born with a big mole that covered her body. 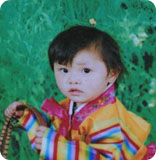 Her mother took off when Jiang-Li was just two years old, and was never heard from again. 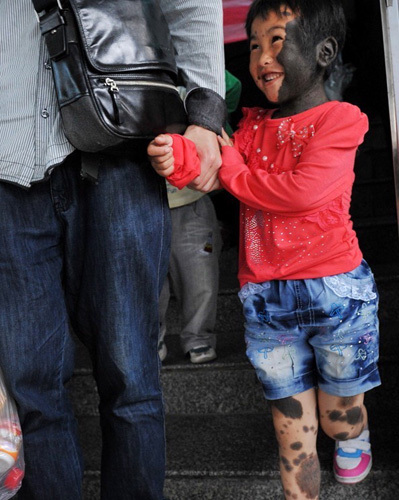 Soon after, her father dropped her off at a kindergarten in Guiyang City, and didn't come back to pick her up. Jiang-Li's grandparents had passed away. Jiang-Li was literally an orphan now. Her kind Great-Uncle heard about her story and took her into his home. Since then, he has been taking care of her for almost four years. One day, Jiang-Li's Great-Uncle took her downtown. While they were made fun of by people as they were getting used to, a local volunteer saw the incident, took a picture, and posted it on the internet. A friend of mine saw the post on the internet. She knows that I have been doing some relief projects for poor children, so she forwarded the story to me. When I first saw the picture of the innocent child, my heart was broken. Such a little girl is suffering such a huge unfairness. She is also a human being, and she is just a little child that needs to be taken care of. I forwarded the post on the internet to Professor Zhang, an orthopedic specialist at Shanghai No. 9 People's Hospital. Professor Zhang replied to me immediately about the treatment procedure and budget. I was so happy when I heard that the AngelMom Fund will be funding part of Jiang-Li's treatment fees. I contacted the volunteer in Guizhou right away. They went to Jiang-Li's family to double check the case, and also to help Jian-Li's family fill out the application forms from the AngelMom Fund. At the same time, the media in Guizhou saw our post on the internet and went to Jiang-Li's family for a visit. They posted her story on the local news on June 6th. On June 8th, we received the application forms for the AngelMom Fund and all the supporting documents that we needed. 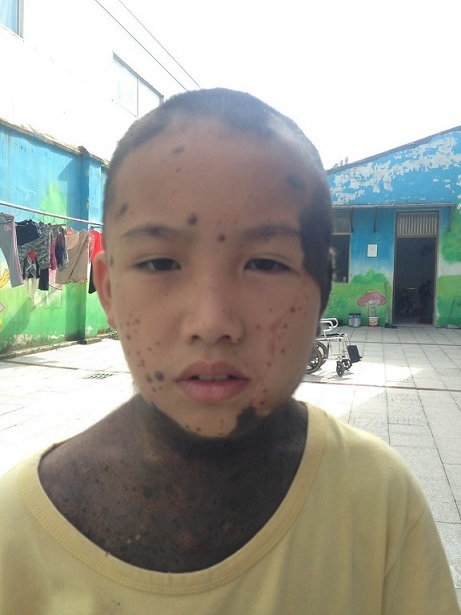 We hope we can raise enough money for Jiang-Li's surgery expense. It was a lot of work for the two volunteers in Guizhou to take a whole day to drive to Jiang-Li's family to confirm the situation. We really appreciate their hard work. At the same time, we consulted Professor Zhang at Shanghai No. 9 People's Hospital again. He suggested Jiang-Li to have 6-7 surgeries. The whole process will last about 2-3 years. The total estimated expense is about RMB 120,000. We suggested the doctor to have Jiang-Li's face operated on for the first step of the surgeries so she can go back to school soon. The first step will need about 2-3 surgeries and will take about half a year. For each operation, Jiang-Li will need to stay in the hospital for about a week. We've finished most of the pre-work for the research and planning. Now it is the time to raise enough money for the complete treatment. 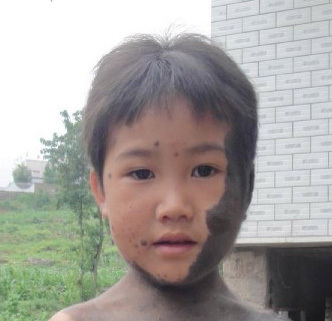 Jiang-Li's Great-Uncle is the only source to earn the income for the family. They cannot afford the high medical costs. It is also not his responsibility to take care of a child who is not in his family. We are hoping that we can get more and more people to help this little girl. The volunteers helped Jiangli find her father after her first surgery in 2012. 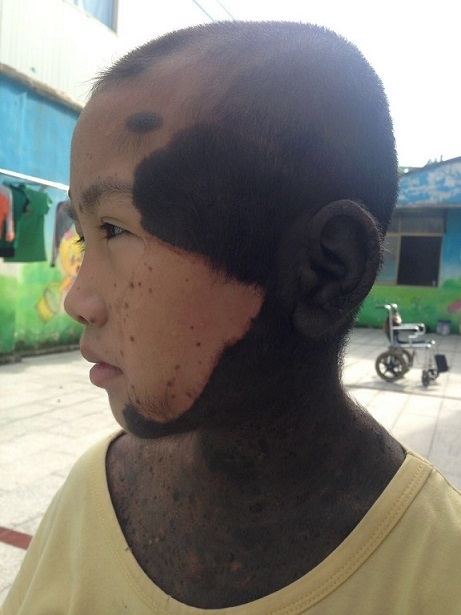 Jiangli also had the second surgery on part of her face in January 2014. Unfortunately, due to the lack of cooperation from her family, there is not much progress for her treatment since then. 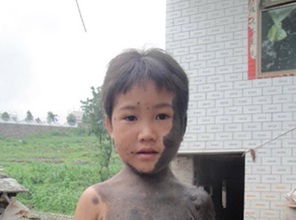 About one year ago, Jiangli's father abandoned her again (left her with her grandmother in Jiangsu province). She was then sent to a local school for children with special needs not long after her father left her. Jiangli has stayed in that school since last summer. The teacher told the volunteer that Jiangli is happy over there, even though her relatives barely come to visit her.